International Journal of Research in Health Sciences,2016,4,4,88-92. Department of Otorhinolaryngology, Great Eastern Medical School and Hospital, Ragolu, Srikakulam, Andhra Pradesh, INDIA. Introduction: persistent otitis media is classified as a tubotympanic disease and is characterized by vital perforation. Eustachian tube is the major focus in middle ear disease. Pathological results in the nose or the nasopharynx are moreover responsible for insufficient tubal function. Objective: To evaluate the outcomes of septoplasty followed by myringoplasty and myringoplasty without septoplasty in patients with tubotympanic diseases in terms of Graft uptake, audiological outcome and late complications. Materials and Methods: The study was conducted in the Department of Otorhinolaryngology GEMS, Ragolu, Srikakulam for a period of one year. A total of 52 patients who were suffering from tubotympanic diseases were treated with myringoplasty for the treatment of chronic suppurative Otitis Media. The patients were randomly divided in two groups of 26 each and were either treated with myringoplasty alone or septoplasty followed by myringoplasty after 6 weeks. 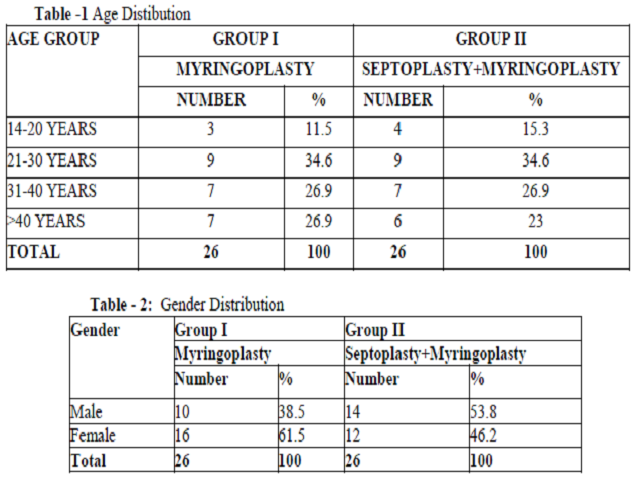 Results: The graft take up was 84.5% in septoplasty preceding myringoplasty and 80.7% in myringoplasty group. During our study success rate was found to be 84.6% in septoplasty preceding myringoplasty and Air bone gap was reduced to <20db in 92.3% of cases. In current study there was neither worsening of existing conductive hearing loss or development of fresh sensorineural hearing loss subsequent to surgical procedure.